I’ve a old WD5000AAJS where I’d like to retrieve data’s (I don't have anymore the computer on which it was connected). I tried to connect using my USB adapter. At the beginning my Windows 7 install the driver, but then I don’t see it in the file explorer. When I look in the devices, I can see it few seconds and then it disappear. I also tried on other computers without any success. Then I tried to connect it directly in my computer. Do someone would have an idea to solve my issue? You don't connect +12V and +3,3V. USB Adapters can't have +12V and +3,3V and that's why you cant detect your drive via USB Bridge. That usb cable is only for notebook drives. If you absolutely need to connect the disk via usb, you will need an external enclosure, with its own power supply, designed for 3.5inch hdds. 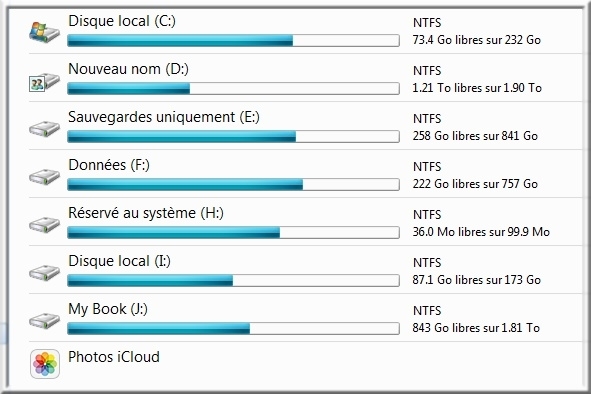 The size of the hdd in disk manager is correct, and it is showing you the partitions. Depending on the way it was formatted/partitioned in the other computer, it may not show drive letters. Were you using linux or some other kind of OS ? Try with dmde and see if it can identify the partitions and file tree. Thank you both for the time taken to try to help me. I understand now, why it's not working with my adapter. However, why doesn't it work when I connect it in my PC as my other hard drives? Maybe the drive have some other issues as well ? I would check S.M.A.R.T. status with MHDD/Victoria and i would do a full SCAN / Verify of the surface if S.M.A.R.T. shows the drive as good. DO NOT USE USB ADAPTOR !!!! 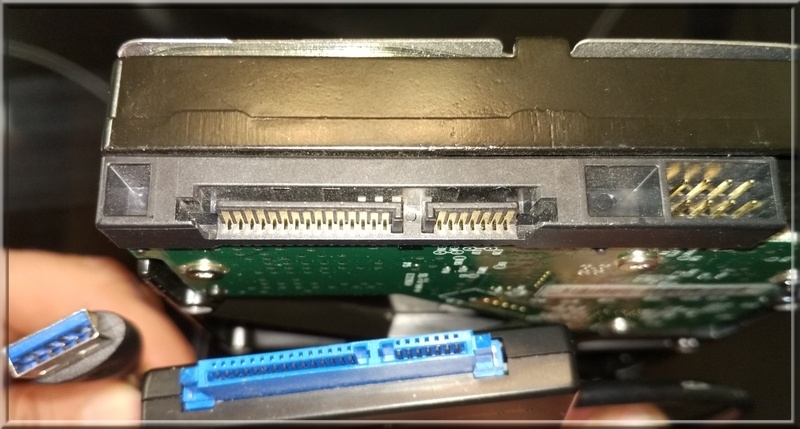 Connect the drive directly to SATA ! If you can't see your data and a surface scan shows no bad sectors and S.M.A.R.T. shows no re-located and pending sectors then you either are using an OS that doesn't know about your drive file system or you have some "logic" problem and you might want to check if you can see your data with logic recovery software like R-STUDIO and whatever you do DO NOT RECOVER DATA BACK TO THE SAME DRIVE !!! If the drive is very slow or have bad sectors, etc you might need to apply a firmware patch and image/clone the drive ! If the drive is "damaged" and a scan with Victoria/MHDD does show damaged sectors then CLONE the drive with something like hddsuperclone and use the logic data recovery software (like R-STUDIO) ON THE CLONE !!! Thank you all for your interest to my issue. I now understand why my USB adapter is useless. 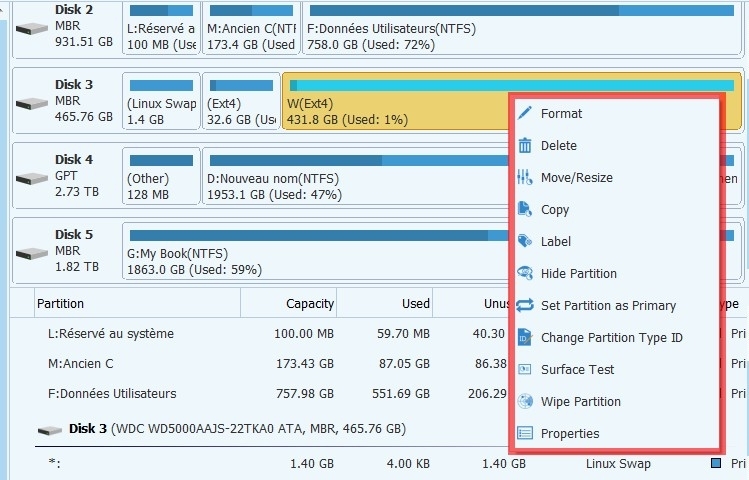 On Disk Management go to the large partition of your drive, right click on it and select "Assign Drive Letter". The usb adapter won't work with a 3.5 drive because the usb port you plug in to is unable to supply enough current to reliably power up the drive. Remember the usb port will typically supply 5v at between 0.5 and 1.0 amps which then has to be raised by the adapter to 12v to spin up the drive. 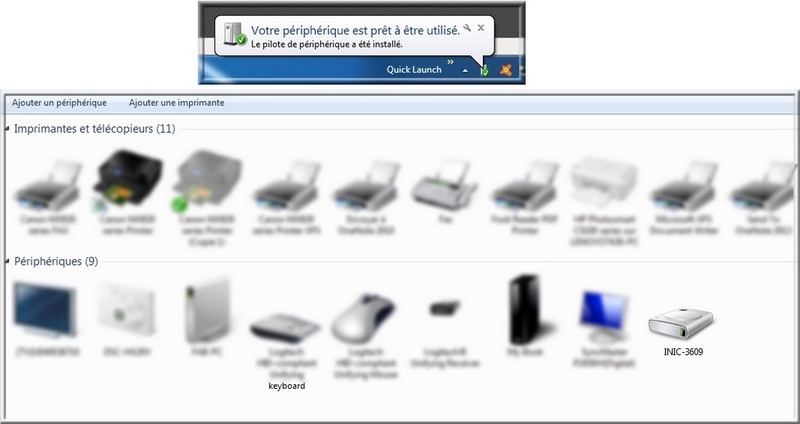 There is a simple solution which I use on a pc desktop system. You need to buy in a sata extension cable. Modify the male end plastic connector to fit the adaptor. Then you need to connect the pc power connector to the drive with the modified sata cable. Plug the cable in to the usb adapter and then plug the adapter in to a usb port. Voila! If you do value your data (you need to recover it) and you can't even use Victoria / MHDD then the safest way is to consult with a data recovery firm and NOT a regular computer repair shop. At this point recovering the data should be cheap. I installed the free version of MiniTools Partition Wizard. Any other thing I could do? Should I change it ? Is there a risk to loose all the data's? The drive is showing 3 partitions in windows disk management, but none of them are recognized by the type. This could be due to logical data corruption, the disk failing to read data due to bad health, the partitions are encrypted, or windows does not know how to read the type of partition (such as if the disk came from a mac computer). My vote is the drive came out of a mac (or maybe from a Linux installation), and windows just doesn't know how to read the partitions. A couple more questions that could help understand what is going on. Did the drive come from a a computer running windows? Was the drive removed from the computer after/because the computer quit working? Please ignore my previous posts, as they were made while your posts were under review and were not visible yet. 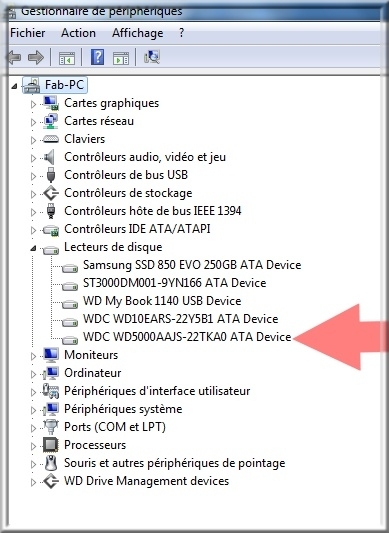 Was the drive originally in a Windows computer? If so, then at some point in time it would appear that someone installed Linux on it. Don't change the partition type. Don't do anything that would alter data on the drive at all. You will likely need to perform logical data recovery, and if you make any changes you will make your recovery chance less successful. I will let others that are more familiar with logical recovery software advise you further. Seems like the drive used to be on a machine that was running some sort of Linux distro (likely), or the drive is coming out of some sort of NAS box. It makes sense that Windows can't recognize the volumes, as Windows does not natively support Ext4 file system. - boot your a computer using a Linux bootable flash drive (e.g. Ubuntu) with this drive connected. I started a Linux session on a USB key. I've been able to see the hard drive, but it's completely empty. I installed R-Studio, but then it asked to also install something else "R". As I don't know what it is, I'm a little bit afraid to put in on my machine. Do not change anything in the partitions yet. Lets first try to understand better the situation. Where was the drive being used ? Connected to a Mac, a linux machine, inside a NAS , some other strange computer ? The MiniTool screenshot show it as a correct linux partition scheme ( swap plus two data partitions ). Understanding from where the hdd came can help to diagnose and eventually fix the problem. It's coming from a normal computer (tower) where windows 7 was the OS. It was the computer from my brother in law. And he received it from a friend few years ago. And what was the problem that happened to the computer ? Has your relative done something to it ? Or taken the computer to someone else before you ? 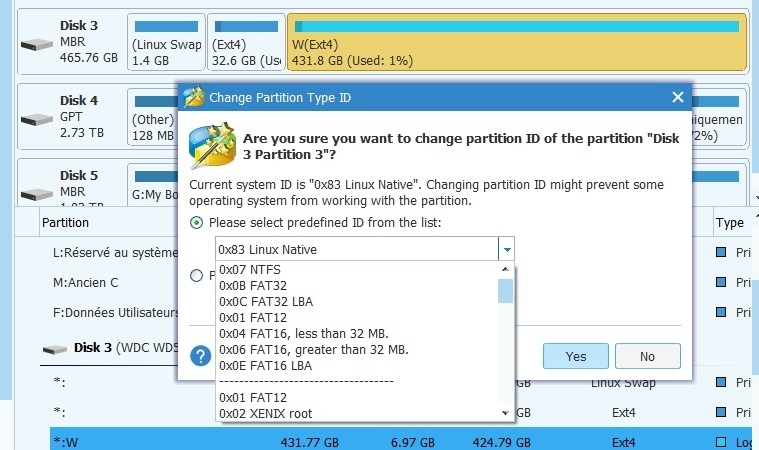 The partition scheme seems correct to a linux installation. Maybe he tried to install linux on the computer , didn´t work or didn´t like it, then remembered to ask you to recover his already deleted data ?